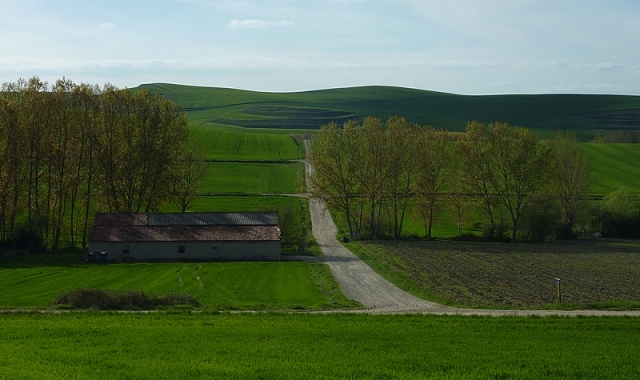 In this easy stage of the journey the pilgrims bid farewell to the land of Rioja to approach Castilla via Burgos. The journey requires a certain amount of momentum, travelling west and crossing a number of locations that remain for the most part, model villages on this Jacobean route. Passing through the main streets of successive enclaves, where hikers will find no problem in purchasing supplies. The walkers can recall the hospitals that during the middle Ages provided shelter to the pilgrims and that, in some cases, still retains their structure. They can also stay in hostels and towns that have captivated illustrious pilgrims, such as Paulo Coelho, author of The Pilgrim of Compostela and sponsor of a hostel in Viloria de Rioja. Diverse examples of Romanesque art, like the baptism basin Redecilla del Camino, strengthen the interest in this rapid passage. The only disadvantage of this step is the number of junctions with the N-120 some are quite dangerous due to poor visibility. In the daily and unceasing advance involved in this French pilgrim route, todays journey will say goodbye to La Rioja to face with strength the long hard journey to the spacious Castilla. This journey does not involve many kilometres for hikers to catch their breath or to enjoy the walk itself. After an intense visit to Santo Domingo de la Calzada (566 kilometres to Santiago), the journey advances through its historical centre, based on a medieval road structure, in which the main street has been converted into the most important area of this town. Along here, the pilgrims reach the street Rio Palomarejos to continue, immediately afterwards, to Avenida de la Rioja. They then reach the neo-Romanesque chapel next to the Bridge, built from large masonry blocks and bricks and constructed in 1917 in honour of the saint and founder of the Camino. The temple stands next to the bridge over the river Oja (from which derives the name of La Rioja). It was constructed after the XVIII century to replace the original one by Santo Domingo. After crossing the bridge, the route deviates to a narrow path on good ground that leads the pilgrims to a number of junctions with the roads along this stage. On this occasion the hikers cross the LR-201 to continue a little further along (the entrance to the road is not straight in front but rather is accessed through an ITV building, technical vehicle inspection) on a wider dirt path with small stones that leads to the N-120. Crossing a smaller second road, they advance parallel to the road, along its left side. As a more definite point of reference, it is situated at the access of Cruz de los Valientes, a monument that informs the pilgrims that they have covered more than 3.5 kilometres since the beginning of this stage. This cross commemorates a battle between two neighbours, one from Santo Domingo de la Calzada and the other from Grañón who starred in the XVII century combat to settle a dispute between the two towns over the ownership of a pasture. Both opponents fought alone in a man-to-man conquest. The first opponent chosen to represent the town to fall dead was that of Santo Domingo. The other from Grañón, died later from his injuries but not before winning the battle against his neighbour. After continuing straight and later turning left, where a milestone indicates the route, the path advances along a number of farm tracks towards the famous hill Grañón, referred to as "Mirabel" which overlooks the whole region. The access to this enclave, the first stop on this stage is along a tarmac path that runs parallel to the access road. 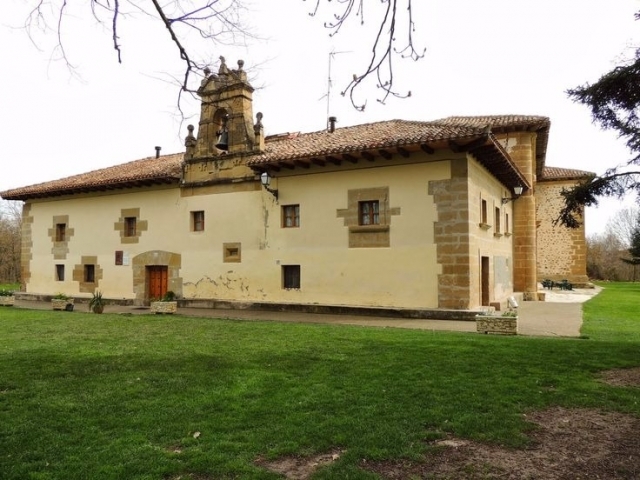 Grañón (16.32 kilometres to Belorado), the last enclave in Rioja on the route, is intensely famous in pilgrim chronicles, previously it had two pilgrim hospitals but they no longer remain. In the IX century the Castle of Mirabel was constructed on the summit where it was sheltered and protected by a surrounding wall. The Jacobean itinerary passes through its beautiful and impressionable medieval urban centre along the main street, Calle Mayor, an authentic haven for walkers with all types of catering establishments. In the centre there are also three obligatory stops for those looking for a special experience and to recover kind treatment from yesteryear one of them takes place in the hostel situated next to the church, San Juan Bautista (XIV century)-within, it hides a Santiago Pilgrim- here the pilgrims can not stamp the credential. The volunteers that work here specify that here the official stamp is the treatment and kindness that draws in the pilgrims who say goodbye with a hug, but not with a signature. The next stop, situated nearby is La Casa de las Sonrisas (House of Smiles), one of the few private hostels financed by donations. The attendant Ernesto Diaz, from Santander is an expert and veteran of the pilgrim route. Having completed the Camino twelve times and worked as a volunteer in other hostels, he decided in June 2012 to open this refuge. Here breakfast and dinner are communal and to many peoples surprise, the walls of the rooms on the higher floors invite themselves to be written on. Many pilgrims leave their mark here, their memories, and the bouncy theme "Good Journey" is written in a number of languages. A third curiosity focuses on a lively tradition that is continued by the local baker Sharon Blanco and the pilgrims resting in the town. Many walkers ask to bake bread at her bakery or to cook small sponge cakes, she always agrees. One day however, it occurred to her to ask for something in return, a reward, not monetary, but yes emotional. So, when they pick up what they had left to cook, they are asked to sing a song. By nationality they sing known melodies from Clavelitos to French or Korean melodies. This custom has extended along the Camino, and has almost been institutionalized and, thus, at 20.00 hours, in Grañón hikers become improvised and cheerful singers. The pilgrims say goodbye at the end of the Calle Mayor, where they should turn right and descend down the hill towards the bridge. Meanwhile their eyes are opened to the beautiful scenery, starring a row of poplars, the route then takes a dirt track to the left, which rises gradually, for less than two kilometres and leads to the hills that separate the communities of La Rioja and Castilla. At the top, and after passing a sign that informs of the change in region, another sign appears warning pilgrims of a dangerous junction. Hikers should cross the N-120 with great care and continue to the left, in the direction of Redecilla del Camino, which is reached after a long straight walk. From this moment, and over the following days, the pilgrims will pass through the province of Burgos from east to west, along a sort of corridor, almost equidistant between the Cantabrian Mountains in the north, and the Douro River in the south. But the immediate goal is Redecilla del Camino, (12.25 kilometres to Belorado) a small enclave mentioned in the Códice Calixtino, its history has strong connections to the ancient route. Today, it still retains a number of useful facilities for pilgrims, such as bars, a bakery and a bank. A jurisdictional pillar marks the beginning of its Calle Real or Calle Mayor, of eminent Jacobean layout, and which remains open all year round, situated at number 24 is the ancient building that was once a hospital for leprosy and pilgrims and is now the albergue San Lázaro. Before leaving this enclave, the pilgrims should visit the Church of La Virgen de la Calle, and its magnificent Romanesque basin of baptism from the XII century, noted for its sculptural decoration and motives that represent this fortified enclave, it is considered one of the jewels of the Camino. From here the route continues along the Main Street and at the end another danger is presented, despite being well sign posted the route crosses with the N-120. Now at the other side it continues parallel to the road and so closely that the two almost touch. A fertile scenery reminds the pilgrims of that they have known, such us Riojilla burgalesa. After crossing a footbridge over the river Relachigo the journey continues uphill, and after less than two kilometres it leaves the hikers in Castildelgado (10.4 kilometres to Belorado), where according to history there existed a pilgrim hospital, founded by Alfonso VII. This small enclave traditionally referred to as Villaipun (Villa de Pan) situates the majority of its architectural heritage along its Calle Mayor, also a part of the Jacobean route. 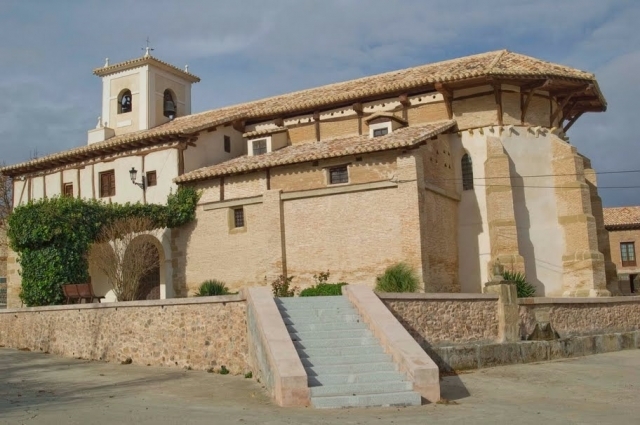 Here visitors will encounter the late gothic parish church San Pedro, inside it conserves a Romanesque baptism basin, and the urban chapel Santa María del Campo, with its portal and baroque belfry. In this enclave the pilgrims will find a bakery, a grocery shop with a drinks machine at its entrance, a bank, and on the road, the Hostel El Chocolatero, the route leads them towards the Plaza Mayor, where there is an interesting public fountain dated 1857. The travellers says goodbye to Castildelgado from Camino de la Cuesta and after another junction with a road they continue parallel to the national road. At first walking on a dirt track and later on asphalt, these few kilometres between the last town and Viloria de Rioja (8.64 kilometres to Belorado), the next stop are covered quickly. In this small village, which takes its name from its geographical proximity and geomorphological similarity to Rioja has a population of just over 60 inhabitants. It is known for being the birthplace of Santo Domingo de la Calzada (born in 1019), illustrious son of the village, his baptism basin has been conserved in the church, (Nuestra Señora de la Asunción) which is also situated just in front of his childhood home, number 2 in Calle Asunción. This village offers hikers a pleasant rest, with the private hostel Acacio y Orietta, run by a Brazilian and an Italian and sponsored by the writer Paulo Coelho, to whom all pilgrims can leave a message. In the centre they will also find Mi Hotelito Viloria, with seven rooms, located in the Plaza Mayor. The route leaves this village after passing a park, and a cemetery and descending onto a local road with bends. Meters after it joins once again the route that runs parallel to the left of the N-120. Along this gravel path the walkers will arrive to the area of Villamayor del Río (4.95 kilometres to Belorado) a new and short stop on the Camino. This enclave is also known as "The village of three lies, because it is not a village, neither is it great, and it has no river”. It is passed in the blink of an eye, along its Calle Real, an authentic street-path. Villamayor del Río has a first aid centre, a playground and a water fountain, although its water has not been certified as drinkable. The enclave has conserved the majority of its buildings in the traditional architecture, popular to this region of Burgos Riojilla. The Jacobean route leaves on the left of the parish church, which is under the patronage of San Gil and plays an important role in the village. It is situated next to the Pilgrim Hospital Misericordia, still structurally conserved. The private hostel San Louis de Francia, which occupies a converted farmhouse, and the Restaurant Casa Leon, situated just outside the village on the national road, where the majority of facilities for pilgrims can be found. Now on the final straight the walker connects again with the gravel path that runs parallel to the left of the N-120. With almost 5 kilometres remaining until Belorado, the end of the stage is covered quickly on this track. On reaching the vicinity of a factory they come to the last inconvenience of the day, a dangerous junction on the right hand side of the national road with poor visibility and no pedestrian crossing. Cross with caution and the route continues along a wide path leading close to "A Santiago", the private, swanky hostel. In this stage, just one last sigh, with a tug and a short walk, hikers reach the centre of Belorado. The gentle terrain makes this stage an easy ride for cyclists who will not find any complications in completing it quickly. 1 reviews Distance to Santiago: 566 km. 1 reviews Distance to Santiago: 543 km. 1 reviews Distance to Santiago: 559 km. 1 reviews Distance to Santiago: 552 km.